Lazy days. Naturally caffeine free. Great taste 2017. What's special about this tea? It may be chilly and grey outside but this all natural gingery lemony brew will sweep you away to a British summers day - homemade lemonade, traditional ginger beer, croquet and morris dancers (ok perhaps a step too far). 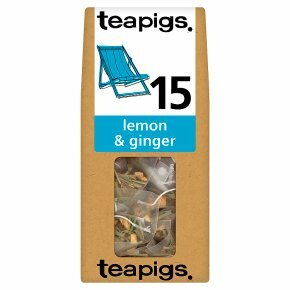 There is no match for the ginger kick and refreshing lemon in this infusion. Louise Our tea temples: We use quality whole leaf only, not the dust found in regular tea bags; whole leaf is best. A tea worthy of worship belongs in our biodegradable "tea temple" - our spacious, transparent mesh bag allowing maximum room for perfect infusion.